Reverse Osmosis: RO systems have been successful in sterilizing water for consumption however, even large-scale commercial systems produce in excess of one gallon of waste water for every gallon of consumable water delivered. In many home systems several gallons of waste water are discharged for every gallon of usable water recovered. This seriously taxes septic systems and the environment. Reverse osmosis systems also remove many vital minerals from the water. Chemical Treatment: Chemical solutions have also been developed to ensure that water is safe for consumption. Many of these solutions include additives that may affect the water’s taste and may be harmful to the environment. In addition, chemical treatments have limited effectiveness against protozoa that form cysts like giardia lamblia and cryptosporidium. Ultraviolet water treatment is nature’s way of removing harmful contaminants from water. It disables even the most resistant biological contaminants yet conserves the healthy nutrients water carries to better hydrate you. In a complete treatment application, prior to being exposed to the ultraviolet lamp, water is passed through sediment and carbon filters. At this stage, all significant-sized particles are removed and the sediment-free water is then treated for odor and taste. Water then enters a UV chamber where it passes by an ultraviolet lamp at a precise rate to ensure proper UV dosage. This UV-C germicidal light ray targets the DNA and RNA of bacteria, viruses, algae, parasites, cysts and other harmful elements. 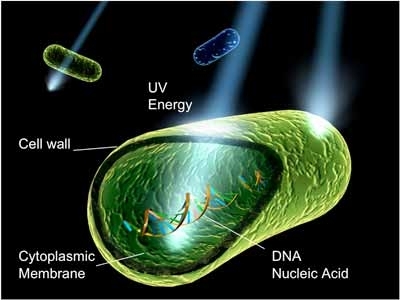 The UV light penetrates microorganisms and alters their DNA rendering them incapable of reproduction. A microorganism that cannot breed is harmless and of no concern to human health. UV dosage determines how much bacteria will be inactivated by the treatment. Dosage is simply a factor of how intense the UV light is and how much time the bacteria is exposed to it. The great news about ultraviolet treatment is that, since UV light does not alter the chemical composition of water, there is no risk of over-treating. 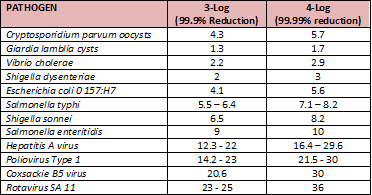 At ECOSERVE, we configure our systems to provide a minimum of a 4-log (99.99% inactivation of bacteria) dose of all major microbiological contaminants. This equates to a dosage of 40 mj/cm2. In the table below you will see the dosage required to provide a 40 mj/cm2 dose for each of the most common contaminants. Better safe than sorry. Why Use UV to Clean Your Water? Most private homes and businesses receive their water from a municipal supply or from a private well. Both sources can become contaminated in a variety of ways along the route to your home or business. ECOSERVE’s UV treatment solutions allow you to take control of water treatment right where you need it: at the site where it is consumed. UV light does not impart any taste or odor to your water and does not require the use of harmful chemicals that tax the environment. UV treatment allows you to serve yourself and your children a glass of water without fear of contaminants and feel better about your water consumption as you begin to eliminate the need for plastic bottles. The number 1 reason to use ultraviolet filtration for your water at home: it is effective. Not only does it eliminate 99.99% of harmful biological contaminants, micro-organisms and chlorine by-products, but it inactivates several pathogens that are resistant to chlorine. Giardia (a common contaminant in the water in Dominican Republic) and cryptosporidium (also known as beaver fever) are highly resistant to chlorine. UV light inactivates them both, making them harmless to humans. The human body is 70% water. The human body ranges from 60% to 75% water depending on your body size, shape, age, etc. One thing is clear: water is the single most important thing you put into your body throughout your life. Making water health a priority is the most reasonable thing you can do. There is no such thing as “pure” water. Water is the universal solvent. That means that virtually everything is dissolved and absorbed into it. Water is contaminated as it falls through the air as rain, as it passes over your roof, as it runs across the earth and as it passes through pipes. The closer you disinfect water to the point of consumption, the “cleaner” your water will be. New York City and Seattle are installing UV systems to treat their municipal water. Several major cities worldwide are leveraging the technology of ultraviolet light to clean water supplies at a municipal level. Hundreds of ultraviolet lamps are currently being installed in New York City to treat 2.2 billion gallons of water a day. Salt water pools generate their own chlorine. One of the biggest misconceptions about salt water pool systems is that they create pool water free from chlorine. Actually, salt water pools create their own chlorine as the salt water undergoes a process of electrolysis. The trade name for salt water pool systems are “chlorine generators”. Chlorine and salt pools generate harmful by-products. When people get out of their pool, they leave behind different forms of organic matter (sweat, urine, body oils, etc.) that reacts with the chlorine in the pool. The disinfection by-products and chloramines that result from these chemical reactions are linked to asthma, allergies and certain types of cancer.